After decades of stagnation, mobile satellite connectivity is suddenly made new by fresh innovation. I don’t know about you, but 10 years ago I thought mobile satellite internet access would be much cheaper by now. It didn’t happen. Connecting from a mobile device via satellite carriers is expensive, slow, hard and limited. Which is surprising. Especially because satellite data is flying high in other realms. Homes, for example. ViaSat is offering unlimited-data, 100 Mbit/sec. downloads to homes for US$150 per month. (That comes with some downsides: That price is for the first three months — it’s $200 per month after that; uploads are only 3 Mbit/sec. ; and some customers grumble about various problems with the service. Still, it’s a way to get affordable, fast internet outside of cities. ViasSat is already investing in faster and more widely deployed service. Airplanes are increasingly benefiting from satellite data. In the early days, most Wi-Fi offered by U.S. carriers used ground-based connections and functioned only domestically. But the major carriers are investing in satellite-based inflight Wi-Fi and claim that within a few years, passengers will be able to stream live HD video on international flights. Prices are expected to come down a bit. Even boats are benefiting from the satellite broadband revolution. Just this week, a company called KVH launched its Tracphone LTE-1 product, which brings 100 Mbit/sec. to boats anywhere in the ocean beyond the reach of cell networks. It’s cheap enough ($1,699) to be installed in personal sailboats, fishing boats and other pleasure craft. (Finally, you can go deep-sea fishing and watch the Fishing Channel in HD at the same time.) Boaters can connect multiple devices to the LTE-1 at once. You see what all these have in common? They’re all using satellites to provide high-speed access to the regular internet from existing devices. Unfortunately, that’s not what’s on offer in the mobile space. Instead, mobile satellite phones basically involve a lousy phone with a user experience from the ’90s, plus text messaging and little else. Phone and data rates vary based on plans, location and other factors, but here’s a typical, real-world scenario. Let’s say you sign up with Iridium, which is a top satellite phone company. First, you’ll need a phone. A really good price for a reasonably capable satellite phone is around $1,000. That won’t get you an iPhone-like device, but a bulky phone with a tiny, 2-inch black-and-white screen. You could sign up for the one-hour-per-month plan (an average of roughly two minutes per day), which requires a $50 activation fee and 12-month service contract. You’ll pay $69.99 per month for that hour of talk time, plus $1.39 a minute for any call time after that. Each text message is $1.36. Just to be clear, that adds up to $840 per year even if you never use it. If you’re only traveling a couple of months per year, this is going to be very expensive, and it’s all duplicated with your normal smartphone and wireless contract, because the phone is useless for regular, everyday phone use. This is why most business travelers don’t use satellite phones. There’s got to be a more flexible and innovative way to take advantage of the satellites up there. Very recently, some new options are emerging that are flexible and affordable. Specifically, I’m impressed with four brand-new products that all have some common capabilities. All four let you send and receive text messages and emails. They let you share your location and call for emergency help, and some even give you local weather and let you post on social media. You can do all this from just about anywhere on the planet. Even better, they’re all more affordable than the normal satellite phone scenario I described. A company called Bivy App is creating a product called the Bivystick. It’s not a satellite phone, but a device that connects to your smartphone to give you access to the satellite networks. It even posts updates and your location to Facebook and Twitter. The Bivystick is also practical. It functions as a backup battery for your phone, which you can charge two or three times on a single Bivystick charge. I think the best part is price flexibility. There’s no contract, and you don’t pay for communication when you’re not using it. 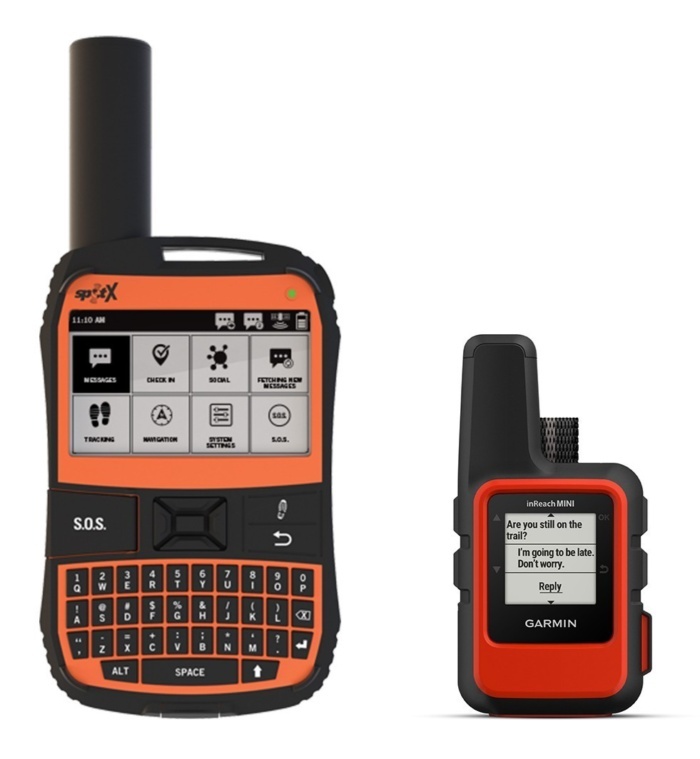 Another innovation comes in the form of the Spot X, which is a rugged two-way satellite messaging gadget from Garmin. It’s like a tiny old-school cellphone with a physical keyboard, except you can’t use it to make calls. You can, however, connect from almost anywhere on Earth via the Globalstar network. Garmin’s Spot X and inReach Mini devices represent the new world of flexible, affordable, practical mobile satellite access. The pricing is all pretty good, too. The device itself costs $249.99, with several annual service plans, the cheapest of which is $19.99 per month. Garmin also sells the inReach Mini device, which gives global coverage via the Iridium network. The device is pretty small — just 4 inches by 2 inches — and it weighs only 3.5 ounces. It even comes with unlimited cloud storage for storing trip plans and mapping data. One neat feature is the ability to write messages in advance, store them on the device, then quickly send them via satellite. The inReach Mini costs $350, and its service plans start at $11.95 per month. The Somewear Global Hot Spot takes a slightly different approach. The gadget connects to your smartphone via Bluetooth and enables your phone to use the Iridium satellite network via an app. The device is small and roundish and weighs only three ounces, and it can fit easily into a pocket. It’s not that cheap, though. The $450 price puts it out of reach for some users. You can, however, get month-to-month subscriptions, which start at $15 for 20 messages per month. One of my favorite new satellite products comes from a company called Thuraya. Its new Thuraya X5-Touch is an Android smartphone that also works as a satellite phone. The company claims it’s the world’s first Android satellite phone — or, if you prefer, the smartest satellite smartphone. As you might imagine, it’s got a “satellite mode” and a “GSM mode.” And both can be active at the same time, making you available even in dodgy coverage areas where connectivity comes and goes. In other respects, the Thuraya X5-Touch is a pretty standard midrange Android phone, albeit one with dual-SIM capability and some significant ruggedization, according to the company. It’s scheduled to ship in Q4. This kind of specialization is one of the great things about the Android platform. Because only Apple makes iPhones, and because Apple doesn’t make any satellite phones, iPhone users are out of luck. Or are they? Thuraya, the same company that makes the X5-Touch, also makes a product called the SatSleeve, which turns iPhones into satellite phones. You’ll have to have an iPhone 5 or 5s to use it, however, or — with special adaptors available from the company — an iPhone 4, 4s, 6 or 6s. The SatSleeve for iPhone is like a clip-on case, and it also offers a rechargeable battery to give your iPhone more battery life. Unfortunately, the SatSleeve costs more than most Android phones — $499. For years, mobile satellite has been a frustrating space for business travelers. To use a satellite phone is to spend a lot, get a little and also have to carry a second, redundant phone. The new generation of devices, however, cuts the cost and lets you carry only one phone, your regular smartphone. They’re still limited, but the ability to send or receive an email or call for help in a remote location — or just communicate in a repressive country where you’re likely to be monitored — is incredibly valuable. With all the new innovative new options in the world of satellite connectivity, it’s time to reconsider mobile satellite.